My husband and I just bought our house. It has a severely overgrown wisteria arbor. We live in Virginia and it is now December... however we are just now having 50° days on average. The leaves are all gone off it. The realtor said it hasn't bloomed for several years. Can we cut it back and reshape it somewhat now? 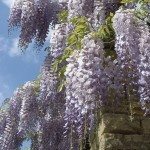 I am afraid that if we do not cut it back some, we could get a heavy snow and the entire arbor may come down along with the wisteria. Please tell me we can trim it back without damaging it too much. 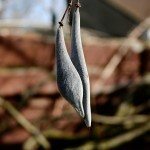 What can I do to encourage flowers next spring?